We prefer iced tea with no sweetener, or a just a touch, such as the bottled teas crafted by Honest Tea and Inko’s White Tea. So we are not a prospect for Sweet Leaf Tea, a brand we’ve tasted on numerous occasions. In organic and all-natural, original and flavored variations (lemon-lime, mint & honey, peach, raspberry, etc. ), it is Southern-style sweet tea. Made with excellent tea, it’s a hit with many, but too sweet for us. 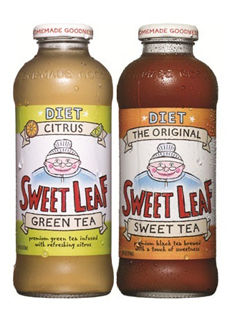 So we were excited when the brand introduced two flavors of Diet Sweet Leaf Tea, The Original and Citrus. They’re absolutely delicious, and some kind of magic incantation must have been cast over the sucralose to make the drinks taste so natural. If you doubt our word that a zero-calorie sweet tea can taste as good as this, company owners Clayton Christopher and David Smith recount the true story of how they ran out of Original Sweet Tea at an Austin City Limits Music Festival. They served Diet The Original for a few hours and no one noticed. Sweet Leaf’s two diet tea flavors. Photo by Elvira Kalviste | THE NIBBLE. As with The Original, Diet Citrus is made with filtered water, plus organic green tea, natural flavors, citric acid and ascorbic acid (vitamin C). While Diet The Original has very fine tea flavor, Diet Citrus has layers and layers of flavor: not just citrus but peach and pineapple, as well. We’ll be ordering them in bulk. Fortunately, both flavors are made in 64-ounce plastic jugs along with 16 ounce glass single-serves. Buy them by the jugful. The line is certified kosher by OU. Here’s a store locator. You can also buy Sweet Leaf on Amazon.com. Find more of our favorite iced tea brands, plus recipes.